Forget the glitter of the San Francisco Film Festival. The real movie event of the year is happening at 9 pm tonight at the Bernal playground, with the world premiere of "Bernaltown," a charming neighborhood fable. It may be the smallest show on earth � a movie starring neighborhood kids, local merchants, the cop on the beat and the staff of the Cortland Avenue branch library. The whole movie was made on location in Bernal Heights, and the price for the world premiere is right � it's free. The story is simple: The neighborhood is threatened by an evil developer who wants to make money by corrupting the area's old-fashioned virtues. A gang of five neighborhood kids, riding soapbox derby cars and armed with magical powers, comes to the rescue. "Bernaltown" has the neighborhood pumped up�"We're very excited and proud of it," said Mauricio Vela, director of the Bernal Heights Community Foundation, the closest thing the district has to a mayor. 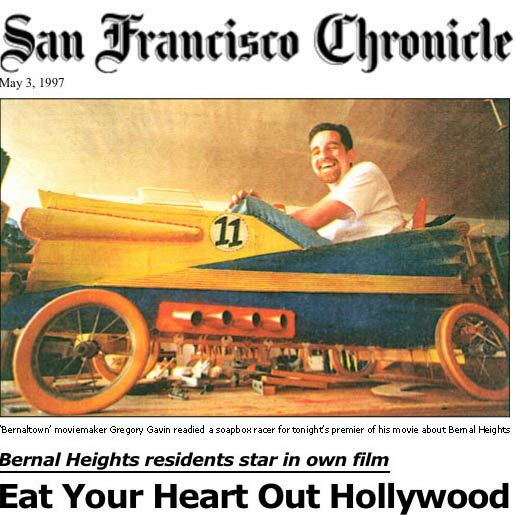 'So far, the movie has gotten rave reviews: "You absolutely, positively, must go and see 'Bernaltown'" wrote the official movie critic of the New Bernal Journal. The monthly New Bernal Journal, in fact, is the only paper to have reviewed the film so far. It's an old neighborhood, laid out just after the Civil War by Army engineers moonlighting form the Presidio. Years ago, cows and goats grazed on the slopes, and the neighborhood still has a country feel. Some streets are so narrow two cars can't pass. Until this year, a few streets on the eastern slope of the hill were still unpaved. It's the kind of San Francisco neighborhood that still has kids, and the kids ride soapbox derby cars down the hill sometimes, scattering cats and dogs. "It came to me while walking the dog," Gavin said, "that the rest of the country is turning into a strip mall, but Bernal Heights is ordinary and old-fashioned, and the ordinariness of it makes it a treasure." Gavin had worked with kids at the Bay Area Discovery museum in Sausalito, building soapbox cars; then he got a gig working as artist in residence at the Bernal Heights Community Center, got the neighborhood young people building them. Cars are magic, he said, even little cars made of skates, pieces of wood, odd parts, and they were devices to involve kids in kind of fun art projects. The cars and their builders made a nice story; they were visual, and on another walk with his dog, Gavin began to think of it as a movie. The plot is uncomplicated: into the quiet world of Bernaltown, the little village in a big city, comes an evil developer promising jobs and money to all, if he allowed to build a gambling casino. Driven by greed, the neighbors at first buy in, but the neighborhood kids appeal to their better nature, and good triumphs. It's silly, but fun. The actors are all neighborhood people: the heroes are five kids, Shila Evanchack, Adaya Brand-Thomas, Josh Morton, David Stoller and Cortney Davis, the villain, a man named Dealer Dan, is played by a woman named Nic Griffin. Very San Francisco. Tommy Chin, a senior member of the Bernal Heights community, plays a kind of wise old guru and steals the show. Making it all took 18 months, proving that even a little movie is a big job. Gavin is not sure what happens after the World Premiere: maybe KQED will show it some night he hopes, or maybe, just maybe, it could develop into a TV series � kid super heroes in San Francisco. All he really knows is that his fable about Bernaltown is rapidly vanishing as new money comes to Bernal Heights�they are selling houses for an unbelievable $500,000 now�and the neighborhood is changing. "'Bernaltown' is a kind of tribute to a historical moment," he says. "And we all know it's going to pass and change soon." "Bernaltown will be shown tonight at the Bernal Playground, 500 Cortland Avenue at Moultrie Street. Live entertainment at 8 pm, film at 9.